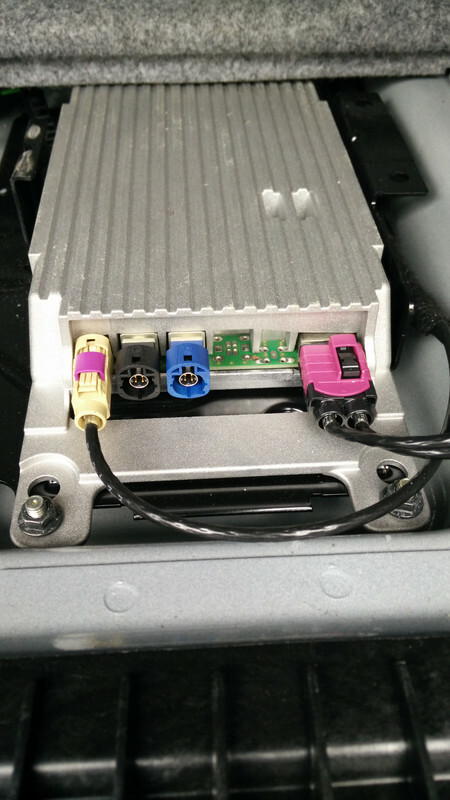 E93 unit in boot - what is it? BMW 3-Series (E90 E92) Forum > E90 / E92 / E93 3-series Technical Forums > AUDIO/VIDEO + BLUETOOTH + Electronics/Alarm/Software > E93 unit in boot - what is it? Have had my E93 for 5 days now, and loving it! Could someone please advise what this unit is in the boot? Also, what are the unused connectors for? Lastly, I am getting very poor FM reception, where is the aerial for FM in an E93 and where does it plug in to? Are there any options for improving the signal? The unused connections are for the USB socket in the centre armrest (6FL) and (I think) for the Sirius module for our friends across the pond. Don't know whether it's also used for DAB in the UK? Are you sure that the FM issue is down to the aerial? Many FM reception issues are down to poorly shielded cables being used to power a dashcam or phone or similar. Also, do you have a 12v to USB converter in either of your cigarette lighter sockets? They can be very "noisy" electrically, especially the cheaper ones. E91 2006. Retrofits:High beam assistant, Individual Audio, Autodim mirrors, CIC, Combox(USB and Bluetooth), Electric Sport Seats, Light package, Front PDC, Heated Steering Wheel, Happy Robot, Climate Comfort Windscreen, Blackline rear lights. Hello, I’m puzzled by almost same thing, I’ve got unused plug under left storage compartment in the boot , anybody knows what’s for? Last edited by Otherwise; 07-31-2018 at 12:10 PM. 2009 118i Monaco Blue "Maximillion"
2009 335i Saphire Black M Sport "Leopold" Cobb tune, Mishimoto FMIC, Cobb charge pipe, Cyba scoops and M Individual Audio retrofit. another for when the top is up.